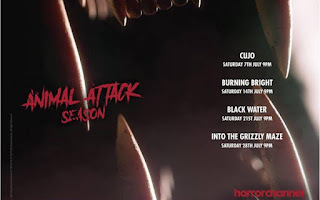 Nature gets nasty on Horror Channel in July with ANIMAL ATTACK SEASON, a beastly collection of movies including the UK premiere of teeth-clenching croc thriller BLACK WATER and the network premiere of CUJI, Stephen King’s macabre tale of a rabid St. Bernard dog, starring Scream Queen Dee Wallace. The prime-time Saturday night savagery continues throughout the month with Carlos Brooks’ wonderful ‘Tiger in a House’ nerve-jangler BURNING BRIGHT and David Hackl’s killer bear actioner INTO THE GRIZZLY MAZE, starring James Marsden, Thomas Jane, and Billy Bob Thornton. When sweet St. Bernard dog Cujo is bitten by a bat, he morphs into a dangerous beast and goes on a rampage in a small town. Stay-at-home mom Donna (Dee Wallace) gets caught in Cujo's crosshairs on a fateful errand with her son, Tad (Danny Pintauro). 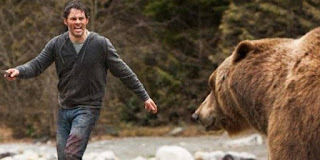 Stuck in their car, Donna and Tad have a frightening showdown with the crazed animal. 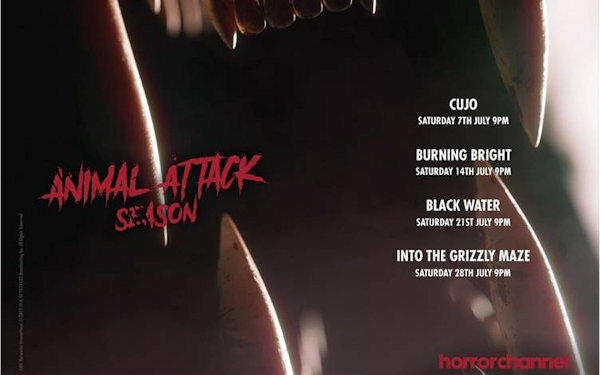 There are also UK TV Premieres for Dylan K Narang’s gruelling survival chiller WAKE IN FEAR and the supernatural shocker BOOGEYMAN 2, starring ‘Saw’ man Tobin Bell. Having witnessed the bloody death of her parents as a child, Laura Porter (Station 19’s Danielle Savre) attempts to cure her phobia of the boogeyman by checking herself into a mental health facility. However, she slowly begins to realise, as her therapy group are killed off one by one, that she is now helplessly trapped with her own greatest fear. Also stars Tobin Bell. This feature debut from writer-director Dylan K. Narang sees an imprisoned young woman (Fear, Inc.’s Caitlin Stasey) unexpectedly cross paths with a desperate man (Markus Taylor of Deadheads) in the den of a mysterious killer.